Irresistably glamorous and perfectly warm. 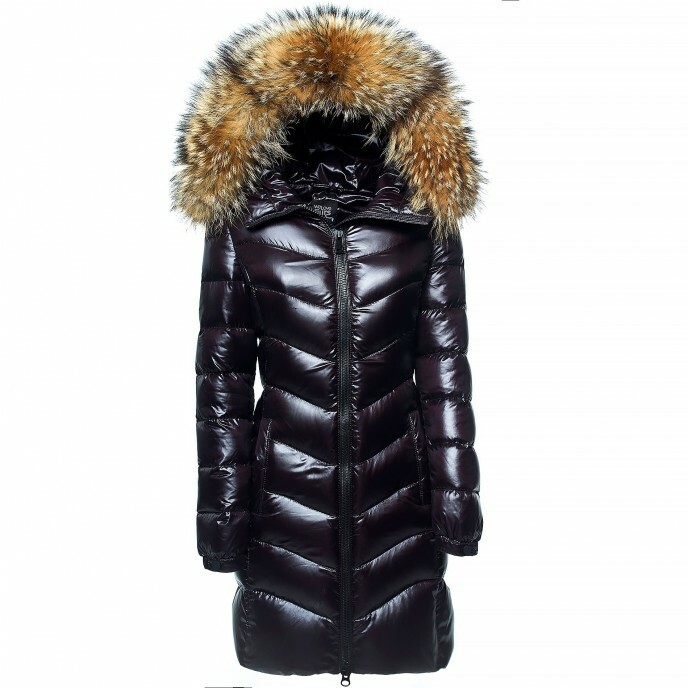 A more extravagant Puffer Coat with Fur Hood can’t be found. Inspite of its extra voluminous down chambers our down coat creates a great impression, with its tight fit, which lets you look super slim even on the coldest of days. 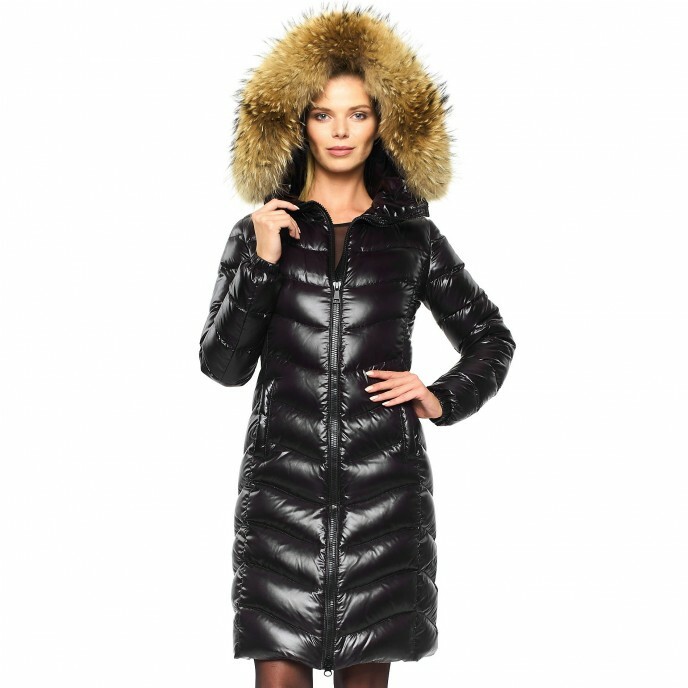 The combination of highly glossy black, slim cut, and maximum size XXL fur collar makes this Puffer Coat with Fur Hood an absolute glamour highlight. First class goose feather, firmly filled down chambers and a high collar keeps you safe even from the ice cold. 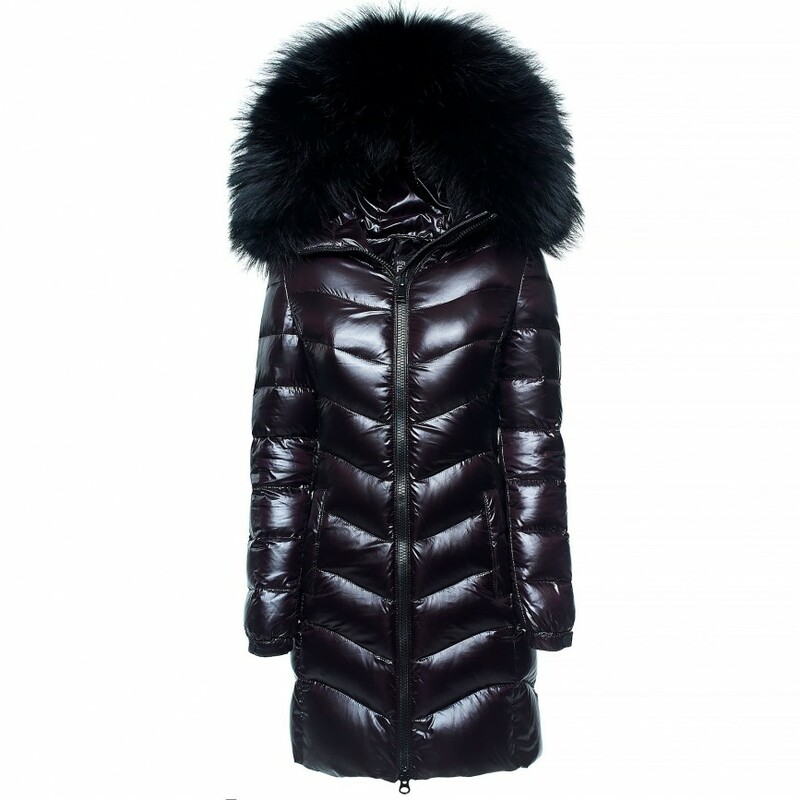 The crowning glory of our Puffer Coat “Ice Black” is the magnificent GreenCollection XXL fur collar Original. WeLoveFurs XXL fur collars aren’t just the biggest and most extravagant, they come from 100% sustainable origin from Finland. Fashion for your karma. Our Puffer Coat with Fur Hood is the perfect winter jacket and can be easily combined with all outfits. Combine it with skirts and high heeled shoes, or with skinny jeans, leggings and boots. Whether for a winter’s day or apres-ski our down coat “IceBlack” sprinkles every outfit with a touch of glamour. The highly glossy black is unbeatably elegant and perfect for combining with other colours. When spring arrives you can detach the XXL fur collar and wear the jacket for a casual spring look. If our Puffer Coat with Fur Hood “IceBlack” has sparked your interest, we recommend our down jacket “IceBlack” with GreenCollection XXL fur collar. Extra warm, incredibly slim and absolutely glamorous. Our Down Jacket with fur hood “MajesticSilver” is an extravagant treasure & at the top of the glamour barometer. The silver grey jacket is available in the short and snug fit from our “Majestic” line, and allows you to look super slim on the coldest of days. The down Jacket is topped off with an beautiful XXL fur collar, where you can choose between glamouros Silverfox or golden Finnraccoon from our “GreenCollection”. Extremely warm, perfectly slim and extra long. Our long puffer coat with XXL fur hood from the “IceBlack” collection wonderfully combines elegance and extravagance. A combination of highly glossy outer material and long close fitting cut, makes this jacket a real glamour highlight, which our wonderful WeLoveFurs XXL fur collars set off perfectly. Extremely slim, totally snug & breathtakingly chic. Our Puffer Coat with Fur “RoyalGreen” lets you look as luxurious as a royal. This extremely warm winter coat is available in sophisticated dark green, creating a perfect match with its golden XXL fur collar. First class goose down, perfect down padding and a high collar keep you safe and sound from the cold. Long fur hooded down jacket "MajesticSilver"
That jacket, that fur. 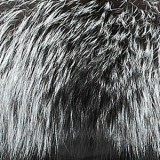 Our long fur hooded down jacket “MajesticSilver” is extremely warm, extremely cozy and comes with an extra large precious XXL fur collar, available as glamouros Silverfox or golden Finnraccoon fur. The jacket is highly tailored at the waist, has a close fitting and is padded with 80% high quality goose down.